Below are VermaPlex® application instructions for vegetable farmers and large scale vegetable growers. Click here for a pdf file printable version for the following specific vegetable application regimes. Add 20-30% worm castings to potting soil mix. Or mix into planting soil. 4-8 Gallons per acre applied foliar spray or drench. Every 7 - 14 days until harvest after fruit sets. Organic Fertilizer Resources: Made by earthworms, enhanced by man. 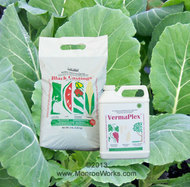 Worm Castings.Liquid Fertilizer Combo - Order together and save on shipping.